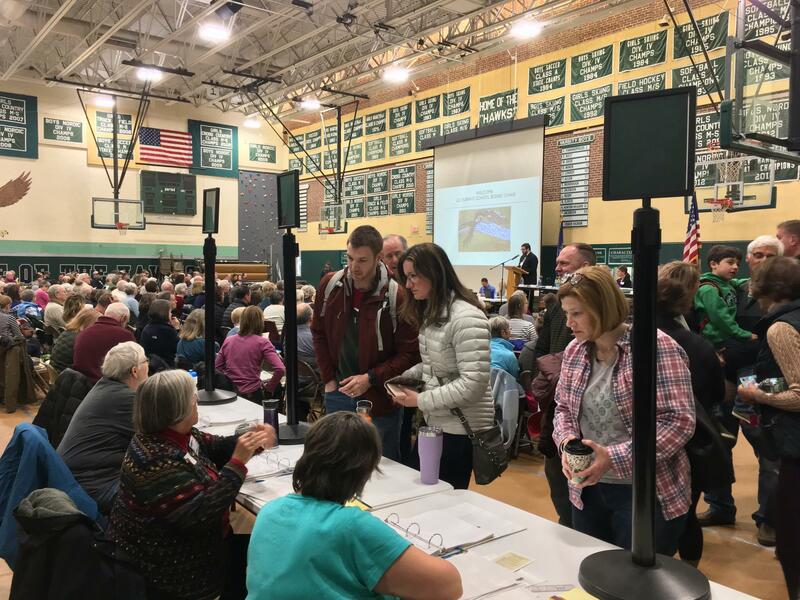 Over 600 people - around 20% of registered voters - turned out to vote on the Hopkinton school budget. Families are streaming into the Hopkinton Middle High School to debate a $10 million bond for building renovations throughout the district. These schools haven’t gotten upgrades for decades, and the bond would pay for everything from leaky roofs to new science labs. Hopkinton senior Bekah Underwood says the old facilities here are a constant headache. "When they redid the gym floor they had a roof leak, and then they had to redo the floor second time," she says. "We don’t have heat some days because they don’t have the boiler working and things like that - it’s interesting to me that we have this good reputation academically, but the facilities don’t really show that." The quality of the schools is a big reason people move to Hopkinton. But the science labs are so out of date, the school’s at risk for losing accreditation from the New England Association of Schools and Colleges. Losing that would be a major blow to the school’s reputation. The $10 million bond would go in part to updating Hopkinton's science labs for the first time in 20 years. But paying for these improvements is tough. The state used to chip in for school construction, but since the Great Recession, it’s frozen that aid. Over the years Hopkinton hasn't been able to approve budget increases for building improvements. And fights over the budget have gotten more heated. School board member Jim O’Brien says part of the problem is Hopkinton property values. "We are a beautiful community but we don’t have those higher value lakeside homes," he says. "We don't have higher value commercial or industrial space to keep your property values as an overall town higher." At nearly $35 per thousand, the property tax rate in Hopkinton is one of the highest in the state.The building bond being discussed today would bump it even higher. The school board originally estimated the upgrades would cost $30 million - now they’ve pared it down to $10 million. "We have nothing if we don’t pass this bond today," says Amanda Gilman. Her kids go to the Harold Martin Elementary School, which would get a $3.5 million expansion with the bond. "We’re short classrooms. We have leaking roofs. These are needs people. This needs to pass." John Herrick owns a wood products company in town. He says he’s paying $100,000 in property taxes, twice what he paid ten years ago. He says this rate hits seniors on a fixed income even harder. "My question is: How long can we continue to operate with this disparity?" he asks. "I’m sorry to break the party up. Thank you." Volunteer Lenny Charron checks off voters' stickers after they cast their ballots. After an hour of debate, the moderator calls a vote. Frank Davis graduated from Hopkinton High in 1960 and comes to these meetings religiously. "There’s too many people that just don’t come," he says, eyeing the lines of voters. "80 percent of the population of the town...then they complain afterwards." Davis voted against the bond because, he says, he’s on a fixed income and can't afford it. "If taxes keep going up, I won’t be able to stay here much longer." An hour later, the numbers are in. The bond passes overwhelmingly: a big boost for schools, and $1.15 more on the property tax rate next year. Jim O’Brien looks relieved. But he says the problem of high property taxes isn’t going away. Residents already shoulder aroud 80 percent of the school budget. "Until there’s another means by which we’re going to fund our schools, this is the conversation we’re going to have because it does impact everyone’s wallets and everyone’s bottom line," he says. This debate is also going strong in Concord. Lawmakers there are considering increasing state education aid, including sending millions of dollars to districts for building projects. O’Brien hopes that money will eventually make its way to Hopkinton, but he says they can’t wait around. Construction will likely start this summer.